Bij Katsudo Kenpo wordt in de reguliere lessen het systeem getraind zoals dat ontwikkeld is door Edmund ‘Kealoha’ Parker. Daarnaast worden er echter ook seminars georganiseerd in het Kenpo zoals dat doorontwikkeld is door Michael Robert Pick. Op deze pagina is alles te lezen wat je weten wil over UKF Kenpo, terwijl hier de blogpagina van UKF Nederland te vinden is. In maart 2014 werden voor de eerste keer in Nederland seminars worden verzorgd door Grandmaster Michael Robert Pick. Grootmeester Michael Robert Pick is een 10e dan zwarte band in Parker’s American Kenpo en oprichter van de Universal Kenpo Federation. Mr Pick was gedurende lange tijd student en vriend van Senior Grandmaster Ed Parker, en ontving zijn eerste tot en met zevende graad zwarte band persoonlijk van Mr Parker. Mike Pick fungeerde als bodyguard van Mr Parker, die vaak naar Mike Pick verwees als Kenpo’s meest vooraanstaande mes-vechter. Mike Pick vocht met het US Marine Corps in Vietnam, en gaf zeven jaar lang les in hand-to-hand combat aan de Special Forces in Fort Carson, Colorado. Hij werd onlangs bekroond als het 22e lid van de International Close Combat Instructors Association. Mr Pick woont nu in Californië en is een professionele smid. GM Pick is one of the foremost combat martial arts teachers in the world, his highly realistic,intellectual, scientific and effective approach to Kenpo inspired me to raise my game as a Kenpoist and a martial artist over 26 years ago, having had the privelidge to be on the mat with him as a young green belt just arrived in America. A man of integrity and action, I can safely say no one has had more of an influence in my martial arts journey and growth. A highly recommended weekend for fellow martial artist in Europe. For those who have never had the Honor of meeting/training with Senior Teaching Black belt- Michael Robert Pick, let me share this. I have known of his reputation since the age of 17 years old through the conversations with SGM Ed Parker & GM Francisco Conde Sr(see reference Ed Parker’s Nunchaku book) and for years I’ve heard of the stories,rumors and countless statements of his abilities with reference to his signature-style of ‘Kenpo’ and of course his ‘Premier Knife’ applications. Then in June 2004 I made a paradigm shift in my Martial Path and set out to add the Principles & Concepts of Mr.Pick’s ‘Kenpo Combatives’ into my own Journey. I am not a UKF member, but I am a student under his counsel,guidance and consider him to be my current teacher/mentor to guide me through what I find functional and useful to those within my Federation(CKF) as well as my VIP Advanced Student clientele. As part of the team of ‘Seniors’ within the Kenpo Community I highly recommend his seminars but any/all opportunities to train and explore the ‘Universal’ theories many of the Kenpo Masters & Professors make available to all generations who seek additional education that may improve, or reinforce your own findings within this awesome System that we all share as a passion. Enjoy and take the opportunity as it will not always exist….as I feel networking is the way of Kenpo O’Hana. Professor Marcel de Jong is an example of what we need and applaud as a future carrier of the ‘Kenpo Torch’ to keep this Flame Burning….TCB! Any Seminar you can join will be another experience, either positive or negative. You can only Learn. As to who or what came first does not matter anymore. What I did was IKKA Kenpo and MY First. 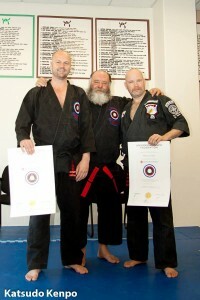 Any Martial Artist should have the experience to join a Mike Pick Seminar.